The Miss America ceremony subtracted the swimsuit competition for the first time in its 98-year history, and subtracted one million television viewers, too. With Miss America now under the leadership of former Fox News personality Gretchen Carlson, the swimsuits were left behind. Instead, they were replaced by onstage interviews where contestants talked about President Trump, the NFL player protests and other topics. Yet the decision has been the subject of criticism. Minutes before the nationally televised broadcast began, a comedian warming up the crowd mentioned there would be no swimsuit competition, drawing loud boos from the audience. It was the pageant’s lowest viewership since 2009, when it was shown on cable’s TLC channel and reached only 3.54 million people. It returned to broadcast TV on ABC in 2011, and its audience has gotten as high as 8.6 million in 2013. 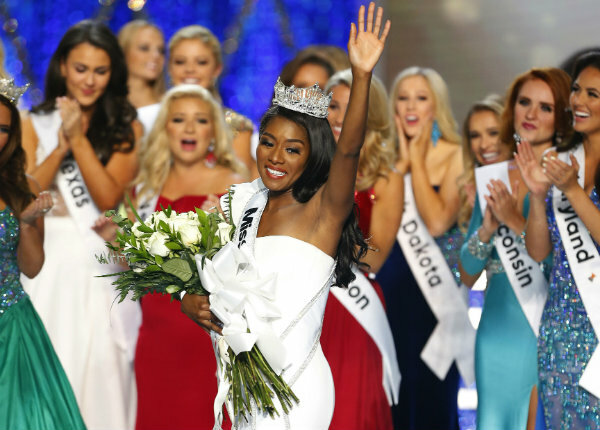 New Yorker Nia Franklin was crowned Miss America on Sunday. Viewership has declined steadily in recent years, from 7.1 million in 2015, to 6.29 million in 2016 and last year’s 5.35 million. Buoyed by two NFL games, NBC won the week in primetime, averaging 9.3 million viewers. CBS had 3.8 million, Fox had 3.52 million, ABC had 3.45 million, Univision had 1.32 million, ION had 1.3 million, Telemundo had 1.25 million and the CW had 740,000. ESPN was the week’s most popular cable network, averaging 2.57 million viewers. Fox News Channel had 2.26 million, MSNBC had 1.99 million, USA had 1.38 million and HGTV had 1.35 million. Below are primetime viewership numbers compiled by Nielsen for Sept. 3-9. Listings include the week’s ranking and viewership. 5. “NFL Weather Delay,” NBC, 12.76 million. 6. “The OT,” Fox, 12.33 million. 7. “America’s Got Talent” (Tuesday), NBC, 10.7 million. 8. “Football Night in America,” NBC, 10.46 million. 9. “America’s Got Talent” (Wednesday), NBC, 9.89 million. 10. “NFL Opening Kick-off Show, NBC, 8.73 million. 11. “60 Minutes,” CBS, 7.1 million. 12. “The Big Bang Theory,” CBS, 6 million. 13. “NCIS,” CBS, 5.96 million. 14. College Football: Virginia Tech vs. Florida St., ESPN, 5.65 million. 15. “Big Brother” (Wednesday),” CBS, 5.53 million. 16. “Young Sheldon,” CBS, 5.52 million. 17. “Rel,” Fox, 5.49 million. 18. “Big Brother,” (Sunday), CBS, 5.48 million. 19. “Big Brother,” (Thursday), CBS, 5.23 million. 20. “World of Dance,” NBC, 5.17 million.